Ask fellow campers about "Buffalo KOA " and nearby attractions. Sites are deceptively unlevel. Hookups on the are probably the most poorly placed we have run into in many years of RV park usage. Hookups were at the far front of the sites which required pulling partially into the driveway. Fortunately a cone was provided to mark the rig and the drive was quite wide so no one else was inconvenienced. No cable at these sites (which was stated in advance) but was satellite friendly. There was a concrete patio but it was situated to the far back of the site so most people would not use it. We would probably stay here again but would first check other parks in town. We camped at Buffalo KOA in a Motorhome. Nice KOA very conveniently located about a mile off I-90. We were in a full hookup pull-through site with beautiful, well-trimmed trees. Ample length to disconnect and park our truck. Sites were a little more spacious than most KOA's but still pretty much an RV parking lot. The bathhouse towards the back of the CG looked new and the showers were very nice. There was only one toilet/shower but there was no wait. Pretty creek running along the back of the CG. Internet was quite slow at night. The only surprise was I thought we reserved a concrete site with a patio, but it was actually a gravel site with a concrete patio. The patio provided a little more space, but not worth the extra fee for us. We camped at Buffalo KOA in a Fifth Wheel. Quick overnight. Staff was fantastic - very friendly and helpful. 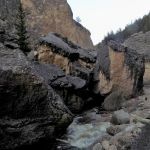 Site was small and close to others and near the road but it turned out to be fairly quiet. Facilities were clean and all in great working order. We camped at Buffalo KOA in a Travel Trailer. There are better sites than this one but worked out well for a quick overnight. Didn't really know about "Longmire Days" in Buffalo until we tried to book a spot. Found out our timing coincided with this event and it was tough to find anything available. Had to settle for KOA. Seems to be what I always hear about KOA. Pay too much and get nothing special. 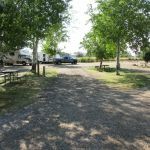 Dusty gravel and dirt driveways, narrow site pad, 30amp electric and water only and paid $60 per night. I would generally expect to pay $30 or $40 for this. The trees need to be trimmed, couldn't put out my awnings without getting them embedded in the tree limbs. The WiFi was bad. Cable service was OK. On the plus side the restrooms were very nice and super clean. I like the arrangement with separate individual shower closets away from the bathroom. This way you don't get people who step out of the shower and then seem to wander around the bathroom dripping water on the floor. Don't you normally dry off after a shower? Anyway, I don't recommend it at $60 per night. We camped at Buffalo KOA in a Motorhome. Good stay during their busy season. 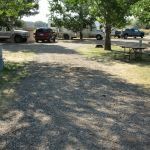 Campground owners run an excellent camp. The signature KOA service is evident. 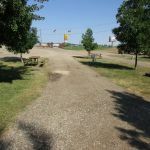 The gravel and grass camp ground has FHU and the electric works--even in the heat of the summer. One site even has it's own private hot tub. I'd stay there again. We camped at Buffalo KOA in a Motorhome. We were surprised as to how this park has changed. Very nice pull through site with trees and grass. We will stay again if in the area. Great place. We camped at Buffalo KOA in a Travel Trailer. Easy to find from I-25. Gravel interior roads and sites. Picnic tables on concrete pads with metal fire "pits" and firewood available in the office. Decent WiFi. Would definitely stay here again. We camped at Buffalo KOA in a Motorhome. Why is this KOA just a Journey when it could be a Resort. One of the better KOA that is not trying to capitalize on KOA name. Excellent staff and management that goes out of the way to help you and offer advice. Very level gravel sites . 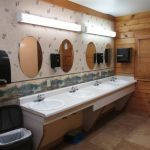 Clean restrooms and showers. The also have Cable and Wi-Fi. Highly recommend. We camped at Buffalo KOA in a Motorhome. Very close sites and lots of children running around. People next to us in W & El. site were draining their gray water. I told them about it, they feigned surprise and said it was "accident". They did it again later so I told the clerk on duty. He said he would check it but I never saw him go the neighbor. We checked out the next morning and got a refund for the 2nd night that we had paid for. I won't go back. We camped at Buffalo KOA in a Travel Trailer. Since we were able to get a cheaper 30 amp back in site that was satellite friendly, we decided to stay here rather than the park closer to town. The site was level, gravel, and big enough for our RV. The site was also had cable TV and the Wi-Fi was good enough for our minimal (e-mail and surfing) needs. Fortunately the small pool was not too crowded. We used the main bath facilities by the office and pool, but there is a second bathhouse at the south edge of the park. So, this is the rare park that has adequate bathrooms and showers. They also have recycling. We camped at Buffalo KOA in a Motorhome. Excellent park Friendly staff in office and provided advice regarding local restaurant. Escorted to our site. I found our neighbor (not present) used our post for TV cable. KOA staff member drove by and saw that neighbor's cable was too short for their site. She immediately provided them with a longer cable and connected them. Would have been a 10 except for: 1. Dog park was all gravel and our dog strongly prefers grass. 2. Site 56 was off level about 2 degrees fore and aft, perfect side to side. We camped at Buffalo KOA in a Motorhome. Don't miss the local Winchester Steak House - 1/4 mile away. Arrive at 5pm opening to avoid a long wait. Great steaks and service. We were able to park our 25' motor home. Too hot to walk but sidewalk all the way. Nice pull thru, easy off of I-25, owners escorted to site. Stayed overnight and didn't have to unhook. We camped at Buffalo KOA in a Fifth Wheel. We had one of their luxury sites, with our own patio, grill and hot tub. We ended up not using the hot tub, but the site was spacious and level. It's a really nice park, but there were a few curves that were tight to navigate in our 35' motorhome. The staff was very courteous and helpful. We'd stay here again. We camped at Buffalo KOA in a Motorhome. For a Excellent Dinner, go to the Winchester Steak house. Summer is busy in Buffalo! Be sure to call for reservations, another park I tried first was full. This is Longmire Country, be sure to visit the Busy Bee Café! Winchester Steak House was excellent. Bozeman Steak House was just okay. The Winchester Steak house is excellent and a short walk down the road. Town of Sheridan is 30 miles north and an easy ride to get there, if you need a larger dept store like Walmart. The Cenex Truckstop has air for free at the truck pumps if you need to fill tires or air ride systems. Call early since this park can fill up quick at night. There are not that many RV parks in this area due to the remoteness. There are loads of interesting things to do in this very small town. 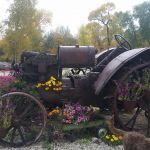 Local history museums, spas, an art gallery, golf, fishing and outdoor activities like hiking, biking and four-wheeling. There's an IGA supermarket right on Hwy 16/Fort Street pretty convenient to the campground; numerous liquor stores for re-stocking your stash; also a small hospital if you get into any kind of health trouble. We especially enjoyed the day trips to the various historic battle fields around Buffalo. The museum has a great reputation, but it was closed for the 2 days we were here. There is excellent Rainbow Trout fishing nearby and a county fairgrounds that puts on an occasional rodeo. The historic downtown is a bit like ours at home...a lot of buildings for sale or vacant. Yellowstone Park is very close by. Go to the historic Occidental Hotel on Main Street and read up on all the history. Beautiful bar and good food. Maverick gas station with diesel right outside park. Try the Bozeman Trail Steak House, located a short distance down the street. Excellent menu, food and local craft brews. Lake DeSmet is a beautiful lake to boat on and is a short drive away. Tour old downtown, especially old hotel. 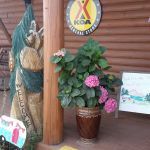 Are you affiliated with Buffalo KOA ?